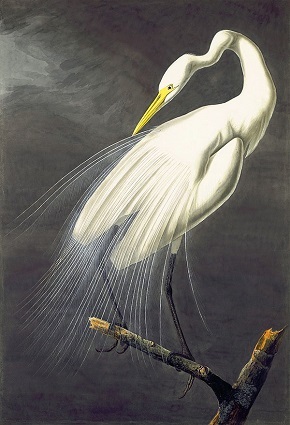 blackchalk on paper by John James Audubon . In recent decades “A White Heron” has found new life as feminist scholars have “rediscovered” Jewett’s writing and reconsidered the story’s themes. Numerous theorists point out that it mimics and then subverts the old-fashioned fairy tale, in which the arrival of a princely figure—a “friendly lad, who proved to be most kind and sympathetic”—challenges a young, sheltered girl to reassess her place in the world. All of which explains why this rejected magazine submission remains Jewett’s most celebrated story, ubiquitous to this day in literature anthologies and on classroom reading lists. Note: The term bangeing was New England dialect for idling, loafing, or taking advantage of another’s hospitality. The woods were already filled with shadows one June evening, just before eight o’clock, though a bright sunset still glimmered faintly among the trunks of the trees. A little girl was driving home her cow, a plodding, dilatory, provoking creature in her behavior, but a valued companion for all that. . . . If you don't see the full selection below, click here (PDF) or click here (Google Docs) to read it—free!